Pokédex Entry When in danger, it raises its ears and releases enough psychic power to grind a 10-ton truck to dust. 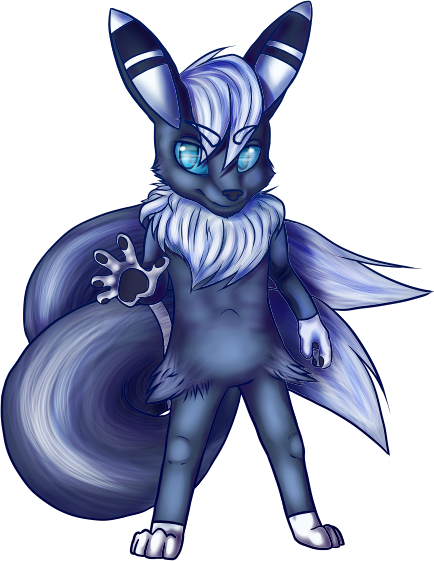 A normal Meowstic with slightly bluer eyes and darker fur. He has a few scars under his fur from harsh battles, and his left shoulder can't completely lift his paw up over his head due to a battle injury. •His genetic mutation has XY chromosomes and he has male reproductive organs but they deformed and therefore renders him sterile. He's not really aware of the sterile part, but he knows his deformity but he doesn't really care about it become self-conscious. So it just makes it a characteristic. •He's actually a dark grey, not the typical blue fur color.